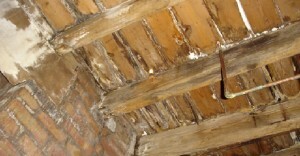 There used to be an old saying that you had better rather go bankrupt than get dry rot in your roof beams. By and large this is no longer the case. If you are so unfortunate to find decay in any of the structural timbers in your house you needn’t go rushing off to the bankruptcy court as it can be effectively repaired. Let us understand the problem. What is dry rot, wet rot and soft rot and how can they affect your home. Essentially they are fungi whose spores are everywhere and thrive with by moisture or damp, This eats away and compromises the strength and integrity of the structure. It works by consuming the cellulose within the roof timber and in it’s place leaves a crumply powdery and porous shell which has no strength. Now if these start occurring in your roof struts, which most people never see, you have to get a roof repair done as soon as possible. Usually you shouldn’t have to worry if the roofing contractor who put up your roof in the first place was reliable. The roofing frames are usually made off site using dry timber. The frames are constructed on a jig and transported onto site and erected. After that the flashing and roof cover (tiles or shingles usually) is put on top and beneath it is the ceiling. Usually the space in between is used for various electrical connections and water pipes. All should be good and remain so perpetually as long as the integrity is maintained and no moisture gets in. It has to be so because most people rarely go in the crawls space above their ceilings and in in any case would never inspect the narrow gaps between the slope of the roof and the ceiling toward the edges. But as one knows entropy can set in and time, bad weather, falling trees and even blocked gutters can damage or displace some roof tiles and allow some moisture into this space and behold, the fungal spores start to multiply and eat away and the wood and if not checked can do an immense amount of damage over time. Possibly the first one will get to know about this is when part of your roof actually starts to cave in and collapse. At that stage there is nothing for it but start and Emergency roof repair. Whether you need and entire roof replacement or can get away with just re roofing part is dependent on the inspection which needs to be carried out. Here the roofing company Shelton Roof are your resident experts in California. Operating for over 75 Years in Palo Alto, Menlo Park and Sunnyvale as well as the surrounding areas they should be your first call. They will do the inspection, including all the difficult to get at places and liaise with your household insurance company as to the next steps and then undertake the urgent work to make your home habitable again. If you have any concerns about your roof call them today.